The Walthers cornerstone 70' single-track railroad through girder bridge is based on one of the most common North American railroad bridges. This style of bridge is used for extra clearance above highways, waterways and multiple-track rail lines. 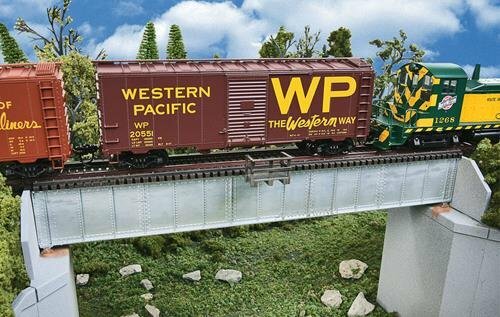 This easy-to-build HO scale plastic kit can be built with an open or ballasted deck. It includes an optional center girder for easy conversion to double-track or wider right-of-way by combining kits. Many 70' installations are used as approach spans to larger bridges, or as Overpasses for multiple-track rail lines and highways, and often multiples are used together supported by center Piers between spans. Add to new or existing scenery with center Piers #933-4550 and abutments #933-4551, both sold separately. Use with Walthers code 83 bridge track #948-886 or #948-899, both sold separately. Parts are molded in dark gray. 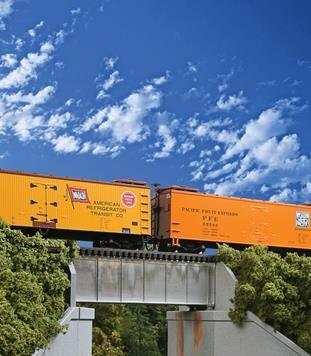 The Walthers cornerstone 70' single-track railroad deck girder bridge is based on one of the most common North American railroad bridges to offer unlimited overhead and side clearance for passing trains. Deck girder bridges are ideal for steam, classic diesel and modern-era scenes. 70' bridge installations are often used as approach spans to larger bridges, or as Overpasses for multiple-track rail lines, highways and streams. 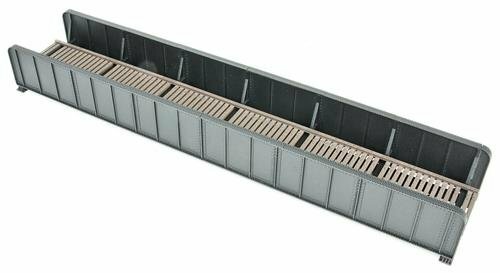 This easy-to-build HO scale plastic kit can be built with an open or ballasted deck. Add to new or existing scenery with center Piers #933-4550 and abutments #933-4551, both sold separately. Use with Walthers code 83 bridge track #948-886 or #948-899, both sold separately. Parts are molded in dark gray. The Walthers cornerstone 50' single-track railroad through girder bridge is based on one of the most common North American railroad bridges. This style of bridge is used for extra clearance above highways, waterways and other railroads. This easy-to-build plastic kit can be built with an open or ballasted deck. It includes an optional center girder for easy conversion to double-track or wider right-of-way by combining kits. Many 50' installations are used as approach spans to larger bridges, or as Overpasses for rail lines and roads. Add to new or existing scenery with center Piers #933-4550 and abutments #933-4551, both sold separately. Use with Walthers code 83 bridge track #948-886 or #948-899, both sold separately. Parts are molded in dark gray. 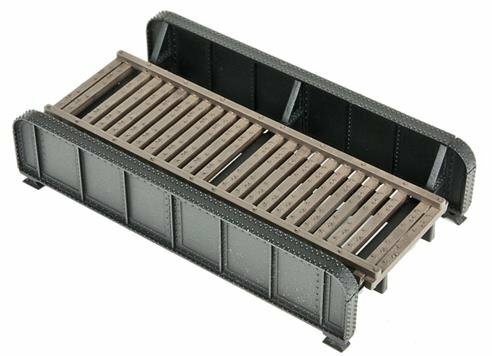 A new addition to our Railway Scenery Range, this Laser-Cut Girder bridge is perfect for all OO Gauge Layouts. A Single-Track construction, this bridge will make an excellent scenic focal point and with it's easy construction and sturdy 3mm MDF it provides a realistic backdrop for any track. Measuring 400mm in Length, 76mm Width and 90mm Height. The Walthers cornerstone 30' single-track railroad through girder bridge is based on one of the most common North American railroad bridge types. This style of bridge is used for extra clearance above highways, waterways and other railroads. This easy-to-build plastic kit can be built with open or ballasted deck. It includes an optional center girder for easy conversion to double-track or wider right-of-way by combining kits. Many installations are as approach spans to larger bridges, or as Overpasses for rail lines and roads. Add to new or existing scenery with center Piers #933-4550 and abutments #933-4551, both sold separately. Use with Walthers code 83 bridge track #948-886 or #948-899, both sold separately. Parts are molded in dark gray. 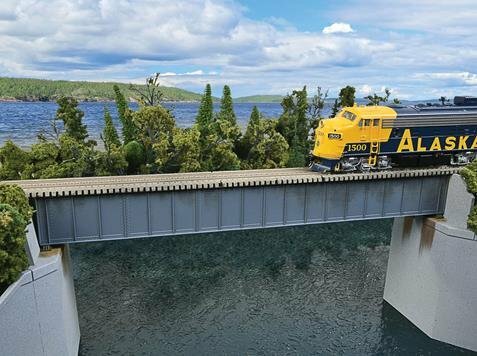 The Walthers cornerstone 30' standard-level single-track railroad deck girder bridge is based on one of the most common North American railroad bridges to offer unlimited overhead and side clearance for passing trains. 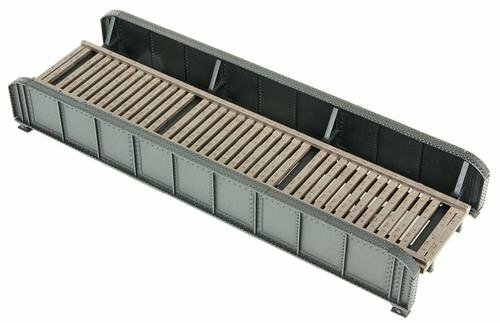 Deck girder bridges are ideal for steam, classic diesel and modern-era scenes. Many 30' installations are used as approach spans to larger bridges, or as Overpasses for single-track rail lines, highways and streams. 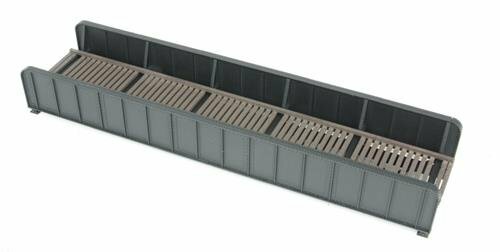 This easy-to-build HO scale plastic kit can be built with an open or ballasted deck. Add to new or existing scenery with center Piers #933-4550 and abutments #933-4551, both sold separately. Use with Walthers code 83 bridge track #948-886 or #948-899, both sold separately. Parts are molded in dark gray. 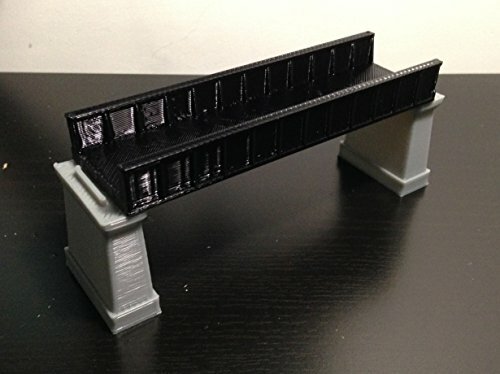 This item includes: 1 Bridge and 2 Piers Similar bridges can be connected Material: Plastic(PLA) Dimensions: Z Scale\1:220 Bridge: 112 (L) x 33 (W) x 13 (H) mm \ 4.41" x 1.30" x 0.51" Pier: 14 (L) x 34(W) x 35(H) mm \ 0.55" x 1.34" x 1.38"
Copyright © Wholesalion.com 2019 - The Best Prices On Single Track Girder Bridge Online.